DEATH AND THE MAIDEN is magnificent. Pure and simple, this master class in acting is a must see. I don’t ordinarily start a review in such a straightforward manner. But I’m concerned that people will miss this incredible piece of theatre if I don’t tell you quickly (and often) to go see the play. You will regret not seeing it. Produced by Diogenes Theatre Company, the same folks behind last year’s BIBI and this season’s Torie Wiggins showcase, TWILIGHT: LOS ANGELES 1992, this play is not for the faint of heart. Annie Fitzpatrick plays “Paulina,” a fearful victim of torture and sexual assault. 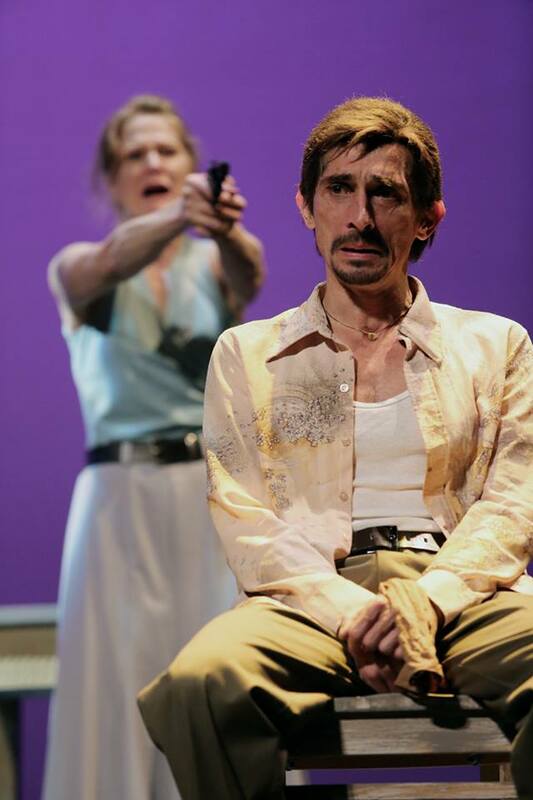 Her husband, “Gerrardo” (played by Michael Bath), has been asked to serve on the President’s taskforce as they repair their country, which is now in a post-dictatorship period. Rounding out the cast is Giles Davies, who plays “Dr. Miranda,” a guy with really bad luck and even worse timing. Cincinnati audiences know Fitzpatrick as a beacon of warmth, love, and sweetness. For instance, when Cincinnati Shakespeare Company cast her as the mother in LITTLE WOMEN everyone in town said, “No duh.” As Mrs. Fezziwig in A CHRISTMAS CAROL she showed a more comedic side, but still exuded the qualities she’s known for. But in DEATH AND THE MAIDEN she blows all of that typecasting out of the water. Her performance is mesmerizing; as a professional counselor I’ve worked with victims of trauma many times. Fitzpatrick plays both sides – the frightened, anxious victim as well as the angry, vengeful, over-the-edge aggressor with such wild abandon that I sat still in my seat, mouth agape, simply amazed. This performance needs to be experienced. Giles Davies, a very popular actor who splits his time between Cincinnati and other cities, has such impressive physicality in spite of being restrained for most of the show. His facial expressions, the way his eyes convey emotion, and his ability to be present in the moment certainly convinced me throughout the performance. He’s brilliant. The play is directed by Lindsey Augusta Mercer; she’s nearly half the age of her actors. Yet, there’s maturity in the way she directs this show. No one ever seems in a hurry. The transitions flow nicely, the pacing is good, and there’s a sense that she’s allowed her actors the freedom they need to create these characters on stage. Fitzpatrick, especially, is fearless in this demanding role – and in my post-show conversation with Mercer it was obvious that she’s just as impressed with Annie as I was. The enthusiasm that a young director brings to a show can sometimes push it from good to great. And make no mistake about it, this show is great. There were a few moments towards the end of Act One where I began to find myself getting restless; there may be too much political talk in the part of Ariel Dorfman’s script. But these actors were as convincing as any I’ve seen on stage all year. I cannot recommend this show highly enough. However, as a warning, there is some very tough material here. Revenge stories are often intense; this one features lots of talk about sexual torture and violence. It’s for mature audiences only. And if you have a trauma history of your own, you might want to think twice before going. If you can handle it, though, I strongly encourage you to get your ticket now. It’s one of the best productions I’ve seen in a very long time. DEATH AND THE MAIDEN runs April 17, 18, 29, 30, and May 1st and 2nd in the Jarson-Kaplan Theatre in the Aronoff Center for the Arts. Tickets are available here.